My 12-year-old son tries to avoid feeling the feelings (these are his words), but he loves dogs, and has enjoyed books in the past that are warm and funny and even a bit sad, so I love sharing wonderful books with him that I’ve enjoyed that might open up his mind and heart. This book touched on all those themes — and included a wonderful dog Flip who indeed befriended a boy Ben right when he needed it. There are some tough issues like foster homes, death, cancer, and bullying. 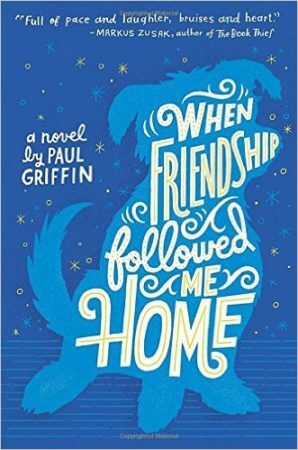 When Friendship Followed Me Home tells the story of Ben Coffin and Flip who are both a little discarded. Ben lived in foster homes until he was about eleven and was adopted by a single woman. Because he’s always felt like an outsider, he’s found relief in books, where he could always find someone like himself. Because of this, he’s endeared himself to the librarian, who gives him books and gives him refuge when he needs it from bullies and real life. One day on the way home from the library, a small, dirty dog follows him home. There’s nothing like a dog to remind you that you belong and you matter to someone. This is a book about belonging — what that really means and how it happens — being true to yourself, and like the title says — friendship. Flip the dog teaches everyone about friendship, but Ben also navigates friendship with his one school friend, and with Hailey, a fellow booklover who just “gets” Ben. Yes, there are a lot of emotional moments and a lot of tough topics, but it’s so honest and sweet and funny that we both raced through the story. I asked my son if he’s still glad we read it, even though there were some sad parts, and he said he was, and he’d give it 5 stars. I agree with that rating wholeheartedly.